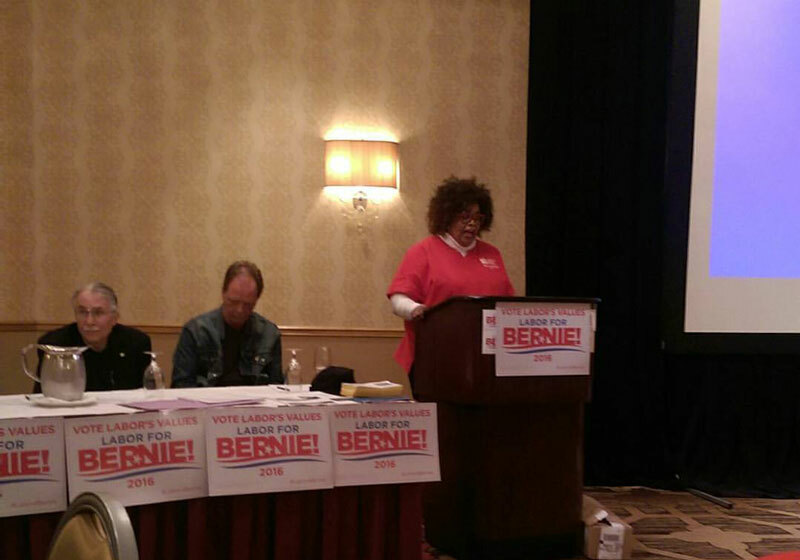 A Nurse from NNU speaks at the Labor For Bernie Meet-Up ahead of the 2016 Labor Notes Conference. On April 1, over 100 people packed a room near O’Hare Airport in Chicago in advance of the biennial Labor Notes conference. Reports were shared from union locals across the country – all reflecting the still growing momentum for Bernie Sanders within the labor movement. Though the internal situations differ, veterans of the labor movement were all astonished at how quickly Labor for Bernie has grown and gathered endorsements. Labor for Bernie has had enormous success: it has nearly 30,000 likes on Facebook, five major national unions have endorsed Sanders as well as nearly 100 other union locals. Most recently, Sanders won the endorsement of the Amalgamated Transit Union (ATU). This groundswell of support, unfortunately, stands in sharp contrast to the role of a number of union leaders who rushed to back Hillary Clinton and, in many cases, gave their own membership no opportunity to express their views democratically. Speakers and participants arrived from around the country including Seattle socialist councilmember Kshama Sawant. Many raised the importance of continuing the network that Labor for Bernie has started after the Democratic primary. There was talk of independent electoral politics and building a lasting alternative, however it was guarded and speculative. To huge applause, Kshama called for labor to make a jailbreak out of supporting corporate Democrats and to run its own candidates. An important element of the forces that could be gathered to form a workers’ party was visibly represented in the room. Reports from unions around the country included the International Longshore and Warehouse Union (ILWU), International Longshoremen’s Association (ILA), Minnesota Nurses Association, the American Postal Workers Union, United Electrical Workers (UE), New York State Nurses Association, New Jersey Industrial Council, and Unite Here Local 2 in San Francisco. Experiences and internal situations vary widely from the NNU which endorsed Bernie nationally, to the International Brotherhood of Electrical Workers (IBEW) which decided on no national endorsement and has let its locals decide their own endorsements. From AFSCME Council 28 in Washington state which went against its international endorsement to back Bernie, to the CWA which did an online poll of its members and now backs Bernie. Bernie Sanders’ campaign is creating political dialogue within unions, between unions, between rank-and-file union members, and a bottom-up pressure on labor leadership. This pressure will continue to push for greater democracy and help redevelop activist networks in locals, and in cities and local areas. Inevitably and correctly, the question of the lack of democracy in some unions around presidential endorsements was part of the discussion. Peter Olney, a retired ILWU member pointed out that LaborForBernie has been crucial to democratizing the endorsement process by providing an organizing nexus and putting pressure on union leaderships. ILWU failed to endorse Bernie several times until the pressure of the LaborForBernie made the difference. He argued for forming an organization out of LaborForBernie to last past the 2016 elections. Larry Cohen, Senior Adviser to the Sanders campaign and past president of CWA, made a special trip to Chicago to address the meet up. He reported from Bernie’s official campaign. The main strategy the campaign for labor is to encourage union members to sign pledge cards to vote for Bernie. He also emphasized an inside-outside strategy, both for the DNC, and for the Democratic Party. He pointed out, “What does democracy look like? It doesn’t look like 750 super delegates.” Yet still he encouraged people to wage a fight within the corporate Democratic Party structures. This strategy does not clearly answer the question of how we will fight and win real change including key elements of Sanders’ campaign like single-payer health care, free education, and a federal $15 minimum wage. This will require the rebirth of a genuine fighting labor movement combined with a political force that is wholly answerable to, and controlled by, working people not the corporate interests who want to keep us down. In the panel, and in open discussion, this question of building a new party to represent the interests of working people was also discussed. Kshama Sawant argued forcefully for unions to run their own candidates independent of the two corporate parties. Fresh from the Chicago Teachers Union picket lines earlier in the day, she pointed out the continued backstabbing of Democratic Party politicians like Rahm Emanuel. In contrast, she brought up the shining example of Seattle where electing an independent socialist was a vital part of Seattle being the first city in the country to win $15. “We railed against the Democratic Party and got a real echo. People are fed up with the status quo. We won because we have Socialist Alternative, an independent organization, free from corporate influence or the strings of the Democratic Party,” Kshama explained. From the floor, Socialist Alternative speakers raised the idea of calling a national conference to discuss how to keep Labor For Bernie together even after 2016 – such a conference could be a step to a new party of the 99% run by, and for, working people with the vital leadership of organized labor. Concretely, unions should look to run independent candidates in local areas to build off of Bernie’s success. Previous articleWho Can We Trust With the Environment?